Back in August, Microsoft seemed to get tired of IronRuby so its project leader Jimmy Schementi jumped ship while asking the Ruby community to step up and get involved in its future. Today, Microsoft has announced new leadership for IronRuby (and IronPython) and has effectively jettisoned it into the community as a true fully open source project. So who's in charge of IronRuby now? Jimmy Schementi, naturally, and Miguel de Icaza, the founder of the Mono and Gnome projects and generally all round super famous open source dude. Schementi has written about what the leadership changes and Microsoft's announcements mean in the greater scheme of IronRuby's development. In short, Microsoft is no longer directly funding the projects but isn't restricting contributions or keeping code hidden behind the scenes anymore either (e.g. the IronRuby tools for Visual Studio). Want to give IronRuby a try or get the source code? 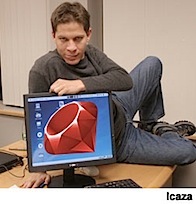 Head over to IronRuby's official homepage at ironruby.net. [announcement] Want a fistful of links to the week's top Ruby and Rails news landing in your inbox each Thursday? Ruby Inside's sister project Ruby Weekly is for you — check her out.